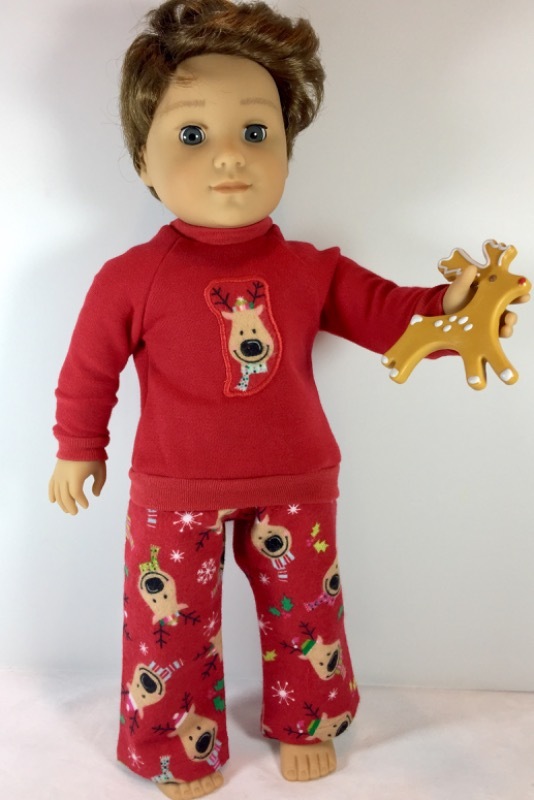 ﻿These cute and cozy pajamas designed to fit 18 inch dolls are a fast and easy sewing project - perfect for a beginner! The top includes a raglan sleeve design and can be made with a contrasting fabric for the front. Chiffon, silk, or even a stretch lace will also work nicely as an optional overlay as well. Using a sweatshirt or fleece knit with no overlay will make a great basic pajama top! Binding on the neck, cuffs, and waist solve the problem of stretched out hems! 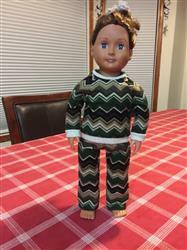 Note - This is the Piccadilly Sweater pattern bundled into a new set with the basic pants pattern to create pjs. Heat Vinyl Transfer application tips included. You will need an electronic cutting machine to create your own designs similar to the "Let it Snow" design shown on the example outfit. Other suggestions for embellishments are: purchased iron on designs, machine embroidered designs, or any hand painted designs. 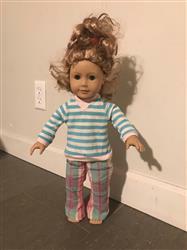 The basic pull on pajama pants can be made from a woven non-stretch fabric like cotton or flannel. Mix and match patterns to coordinate with the top! 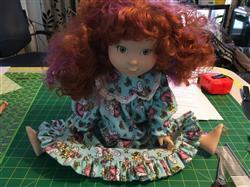 The design goes together quickly and is easy to sew with a few straight seams and a simple elastic casing. Create a variety of outfits with these two versatile pieces. There are so many wonderful options to play with! Use a Christmas themed machine embroidery design to personalize your holiday PJs! 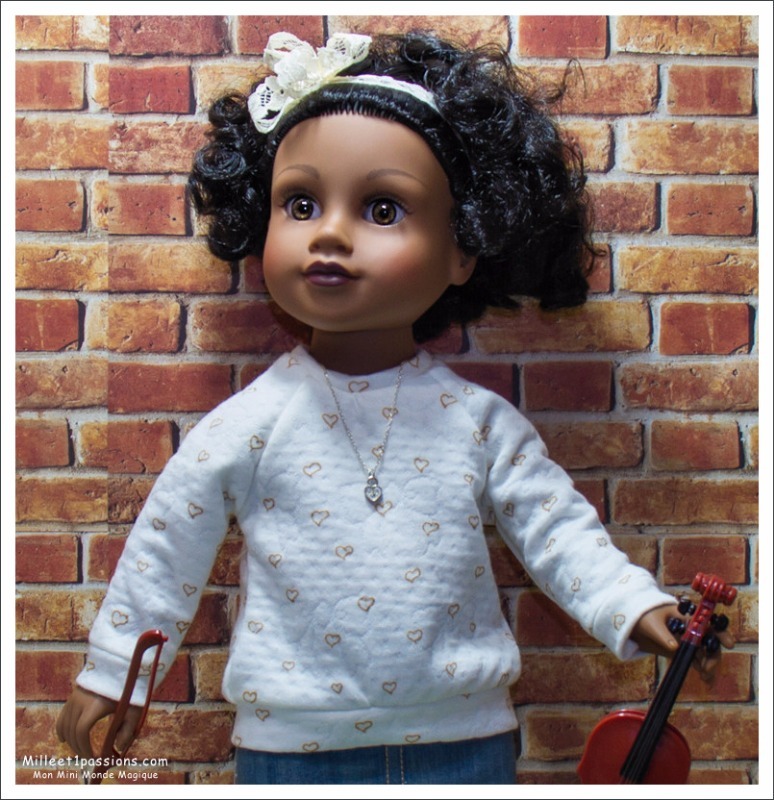 Special Note: This PDF pattern is designed to fit an 18-inch doll such as American Girl® you can also find this cute bundle for 14.5" WW dolls, Disney Animators Dolls, and Les Cheries/HFHG dolls. Love the way the pajama pants fit. Easy Peasy to make, I made five pair the first weekend. The girls love them. Christmas ones are on the cutting board now, getting a head start for next Christmas! Easy to follow pattern and perfect for beginners. This pattern was just what I was looking for. Easy to follow and put together with the detailed instructions included, resulting in a well fitting, cute end product. Now to find a similar one in order to make matching one for my granddaughter. Easy to make, adorable pattern. Looking forward to making lots of PJs. 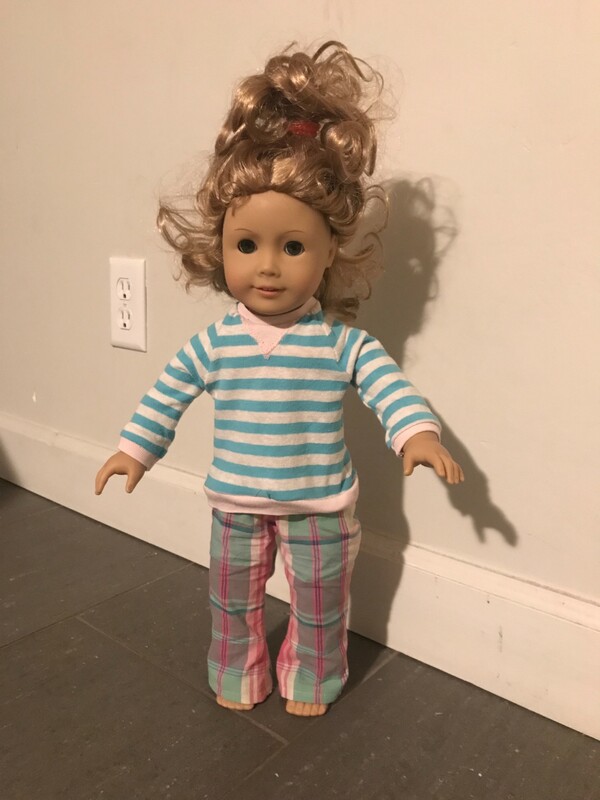 This set was upcycled from an old, holey kids’ shirt and the remnants of a favorite pair of pj pants.